Is buying glasses online for everyone? Buying glasses online is for most, but not all. If you are highly sensitive to changes in lens design or are a first-time user for Progressive Lenses, we recommend that you visit your local eyeglasses shop or optometrist office to purchase your eyeglasses. To order glasses from iLookglasses.ca, you need your up-to-date prescription from your eye care professional, as well as your PD (pupillary distance) measurement. See more information on PD. 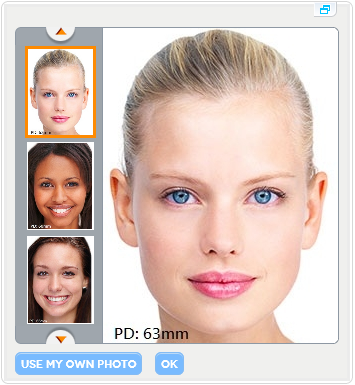 In iLook Mirror, click “change photo” to select a model to try on frames for you. Note: Choose a model of similar PD to yours. New!! Upload your photo to iLook Mirror and try on all the frames! Follow instructions on screen to upload your picture. Your order is shipped using Canada Post to addresses across Canada. In the event of Canada Post labour disruption, Fedex will be used. Prescription glasses ordered will not incur a sales tax. Non prescription items ordered may incur a sales tax. Shipping cost is $9.90 and non-refundable. Orders over $60 (before taxes, after discounts) are free of shipping charges. Most orders are delivered in about 3 to 6 business days. Special-ordered items, including Progressive lenses, Bi-focal lenses, and certain out-of range items, would require 3 to 6 days extra. Exceptions for these estimated duration apply for certain rural areas. More iLook Points = more discounts! 5% of your purchasing dollar amount goes toward iLook Points. In short, if you are not 100% satisfied with your purchase for any reason, simply Return your purchase. Return shipping is on us! Click HERE to see what our customers are saying about their shopping experience with us! We offer a one-year warranty against manufacturer defects on frames and lenses. Contact our Customer Care Representative via email at ilook@ilookglasses.ca to obtain a RMA (Return Merchandise Authorization) and instructions before sending your return. Please note that all items must be unworn and unaltered and are in the original packaging with all promotional items. Please allow 4-6 weeks for your refund to be processed. Administration & Handling Fee of $9.90 will be charged for items returned without a RMA.